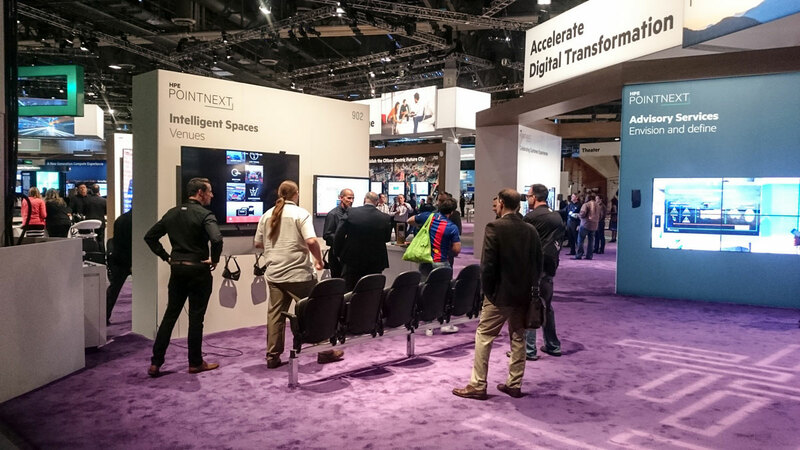 To resolve several seemingly either/or challenges so attendees could fully appreciate a complex technical experience without sacrificing brand or space. We took inspiration from our client’s visual representation of getting the better of two scenarios: The Apple-Orange. 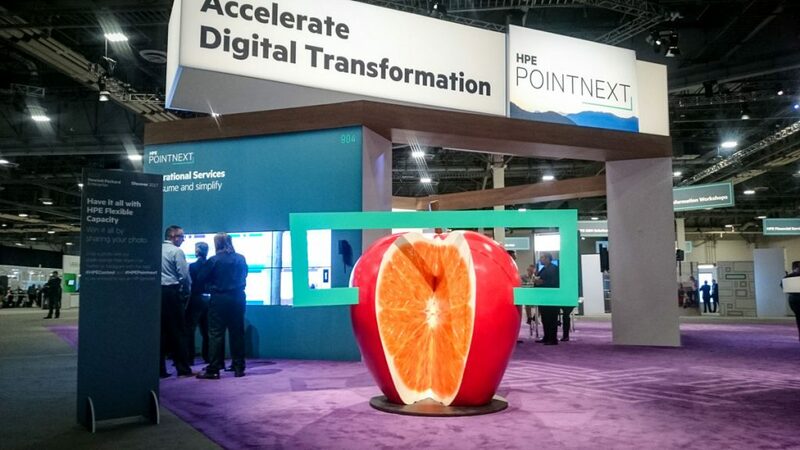 We brought this hybrid solution to life by constructing a really big Apple-Orange for the event floor. We eliminated the need to choose between one thing and another; instead, our client got it all! 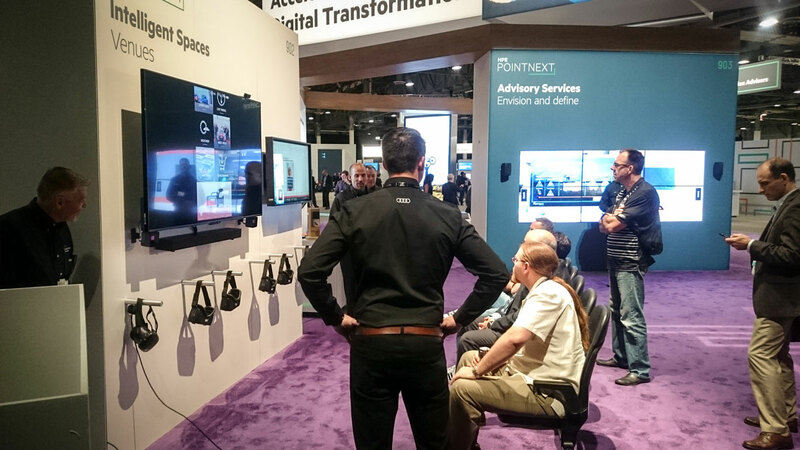 The event demanded Maximum Technology in a Minimal Space, including multiple opportunities for attendees to experience high-tech products and demonstrations. Complex wiring and power solutions for over a dozen headsets, screens, and servers had to be contained inside a sleek, minimal wall that supported the spare, clean aesthetic of our client’s brand. Want more? How about the capability for a “shared” Virtual Reality (VR) experience for multiple viewers with only one headset feeding into the display monitor; for a system that could run unattended; and that wouldn’t pull more than 20 amps of power – all included in a space 24” wide? Why choose, when you can have it all? We did our homework and made sure all our gear was HDMI native, allowing audio and video to travel over shared cables to streamline the infrastructure. This also allowed for smaller physical components that draw less power – the media player was the size of a Post-It Note, and media was stored on a USB memory stick. 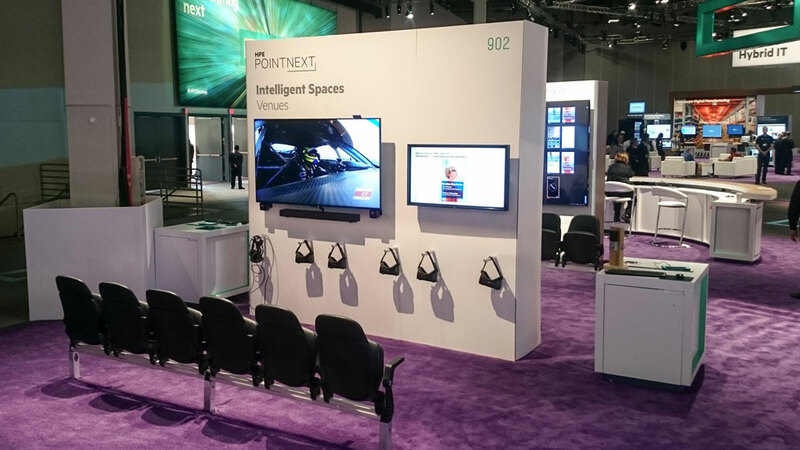 The physical booth, designed and built by Sparks exhibits, was two-sided, accommodating six headsets, two screens, and multiple servers on each side of a hollow wall that contained all the equipment. The screens featured basketball on one side and auto racing on the other. Guests could enjoy their VR experience, and see presenter slides on an additional monitor, from six stadium-style seats. The content of the VR experiences was designed and developed in collaboration with the Phoenix Suns and N1GT Racing to create virtual environments and rides, and powered by our custom-designed code to synchronize the headsets to start the experiences for all viewers at the same time. 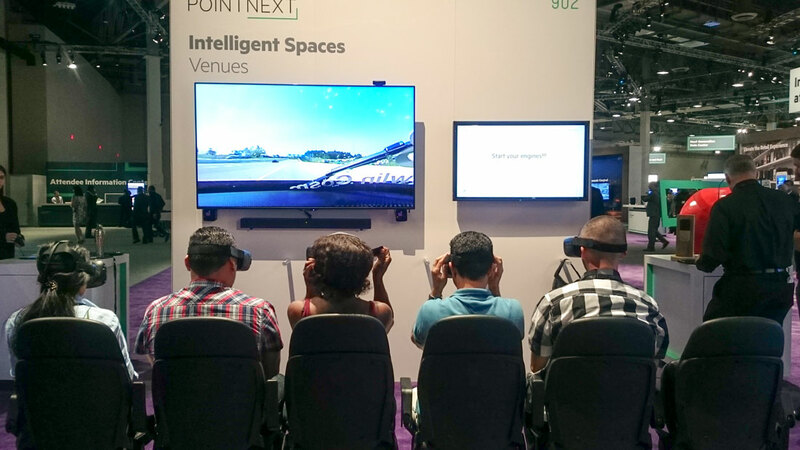 Additional guests were enticed to participate with a trailer we produced to catch their interest, and the VR experiences were played on a screen visible to the entire room so everyone could see what was happening. Because multiple viewers experienced the content simultaneously, and the content was also publicly viewable, everyone was entertained – eliminating the isolation typical of many VR experiences. Staging Solutions delivered creative content and new technology along with supportive infrastructure, to turn our client’s vision into reality in under six weeks. All in a way that featured and celebrated our client’s clean, elegant brand, and fit seamlessly into a larger event-floor experience. No need to choose among desirable outcomes at Staging Solutions. Having experts in creative design, fabrication, technology, media, and execution all under one roof enables us to coordinate our efforts and react quickly, turning our client’s Big Ideas into reality on time and within budget.